L To R: Luzer Twersky, Caraid O’brien, Malky Goldman (Photos: Pedro Hernandez). Avant-garde and absurdist playwright Eugene Ionesco was born in Slatina, Romania to a Romanian father and a French-Romanian mother, and he wrote mostly in French. Not surprisingly, one does not immediately associate Ionesco with Yiddish or the Yiddish theater. However, the relationship doesn't seem strained at all when you consider this: modern Yiddish theater was founded by Abraham Goldfaden, also a Romanian. . . that absurdist theater was hugely influenced by the Yiddish Art Theater movement. . . that so much of Yiddishkeit deals with the absurdity of life. Nevertheless, there's something ironic about New Yiddish Rep's production of Rhinoceros, an allegory on the rise of fascism. After all, the Yiddish speakers were the victims, not the perpetrators of the Nazi atrocities. Written in 1959, Rhinoceros is widely considered to be Ionesco's reaction to the rise of fascism and anti-Semitism in Europe. Although Ionesco was not Jewish, his mother came from a family of Sephardic Jews who had converted to Calvinism. As early as 1936, Ionesco criticized the anti-Semitic and fascist Iron Guard, which he claimed created "a stupid and horrendously reactionary Romania." And in 1970, Ionesco explained that his play was an attack on those university professors and students he had known who became "a Rhinoceros" because they were "caught in a mechanism [accepting] everything." In the New Yiddish Rep's staging, translated by Eli Rosen (the play is performed in Yiddish with English supertitles) and directed by Moshe Yassur, Berenger (Luzer Twersky) the principal character, is a Jewish everyman — a schlemiel who is roundly chastised by his more upstanding friend Jean (Eli Rosen) for his drinking, lateness and general irresponsibility. After the rhinoceroses begin wreaking havoc on the town, Berenger and his fellow employees at the local newspaper have talmudic debates on the nature of the catastrophe. Sean Griffin, as the logical Dudard and Alec Leyzer Burko as the volatile Botard are particularly effective in demonstrating the absurdity of much human debate. 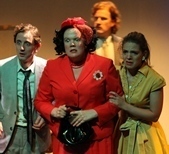 Soon more and more of the townspeople become rhinoceroses, until Berenger and Daisy (Malky Goldman), his girlfriend, are the only ones resisting. Even they are not in complete agreement on how to deal with the takeover of the rhinoceroses. One has the feeling Berenger's passion and Daisy's faintheartedness are much more ridiculous in French. Rhinoceros has a minimalist set, with only a desk and bed pulled out from bare walls when necessary. The assault of the rhinoceroses is indicated by offstage sounds and an occasional mask. But what we don't see is heightened by our imagination. After the Broadway premiere of Rhinoceros, most critics thought the play was very funny. Ionesco was not pleased. He believed his play was a tragedy in which the will of the masses overwhelms individual responsibility. While it's not evident that this Yiddish translation adds anything to Ionesco's original work, it certainly is a faithful translation of his tragic message.